In what was viewed as a bit of an unorthodox move, Charlie Manuel started Kevin Frandsen at first base yesterday in place of Ryan Howard. Howard was hitting .303/.342/.606 with five HR in his last 19 games and has been locked in, so it came as a surprise to some when he was replaced in the line-up by Frandsen. 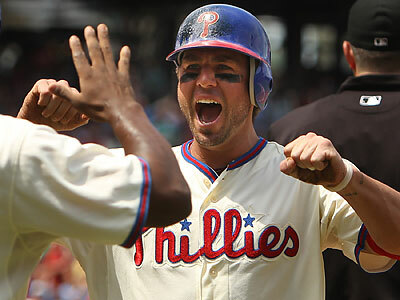 Frandsen rewarded the Phillies with a 1-4 day at the plate with a solo HR but even if he wouldn’t have hit the home run, Frandsen being in the line-up showed some forward thinking by Manuel. Even though Howard was smoking hot, sitting him in place of Frandsen was the right move. What may have triggered the move was Howard’s lack of success in a small sample against Zito (1-10, 5 Ks) and Zito’s suddenly dangerous-again 12-6 curve that would have easily fooled Howard all day. But Manuel’s decision should not be limited to tough lefties with breaking balls: simply put, Frandsen should be in the line-up more, at first base or other positions, against lefties. This isn’t a “Platoon Howard” piece more than it is a “Play Frandsen Against Lefties at some position more often” piece. Small sample warning applies and all that but here are the facts: Frandsen has hit .291/.332/.444 against lefties in 278 PA and .400/.426/.554 last season in 68 PA. He has a 74 point career difference in ISO and is among the Phillies best platoon options. Now Ian, you may ask: where would the Phillies play Frandsen? Surely not in place of Michael Young, who has hit an even more-impressive .313/.365/.469 against lefties. But Frandsen is more than capable as an every four or five games replacement in place of Chase Utley, a career .266/.375/.470 hitter against lefties, or Jimmy Rollins, a career .272/.326/.426, as he appears to be a more-than-competent option against lefties. Yesterday was a glimpse of Manuel managing well in the event of a tough match-up – he should use Frandsen more freely against lefties to spell his veteran infielders.